Press release and photo provided by Jim Holland, General Manager of the Princeton Rays. The Princeton Rays announced on December 14 that Michael Johns will return for a second consecutive season in 2011 as manager of the team and will lead a coaching staff of familiar faces this coming summer. Joining Johns in returning to Princeton this coming summer will be pitching coach Marty DeMerritt and hitting coach Wuarnner Rincones. "It's most always a plus when anyone on your coaching staff returns because it breeds familiarity with the local fans. In our case, it's a real bonus since all three of these fellows have enjoyed success previously in Princeton and we are getting them all back," commented P-Rays' General Manager Jim Holland in making the announcement. Johns will be entering his fourth year in the Tampa Bay Rays organization and his second as manager at Princeton where, in his pro managerial debut last year, he piloted the P-Rays to a 33-35 record. He had the team in contention for a 2010 Appalachian League playoff spot until the last few days of the season. Prior to arriving in Princeton last summer, he had spent the previous two seasons as the hitting coach of Tampa Bays' short-A affiliate, the Hudson Valley (NY) Renegades. His other coaching experience includes being head coach at Orange Park (FL) High School from 2004-2007 and the four years prior to that as an assistant coach at Fernandina Beach (FL) High School. As a professional player, he was selected in the 19th round of the 1997 amateur baseball draft by the Colorado Rockies. His pro playing career spanned two years (1997-1998) as a middle infielder for the Rockies' class-A affiliate teams in Portland (OR) and Asheville (TN). Johns, currently a resident of Orange Park, FL, is a graduate of Tulane University, where he was a two-time Conference USA all-conference shortstop for the Green Wave. "MJ (Johns) really came in and did a great job for us last season. He's efficient and organized as well as being great to work with in terms of the things I have to get accomplished as a general manager. We enthusiastically look forward to having him back with us in 2011," said Holland. DeMerritt will be back for a fifth straight summer in 2011 at Princeton and continues to add to an impressive list of credentials that has spanned his 35-year career in professional baseball. He guided his 2010 P-Rays' mound staff to an outstanding overall 3.23 earned run average, which included pitchers Enny Romero (1.95) and Braulio Lara (2.18) finishing in the top two spots in the Appalachian League in this category. During his past four years in Princeton, many of the top pitchers now in the TB farm system have been under his instruction at some point. 2011 will mark DeMerritt's 11th year in the TB organization and his years prior to Princeton in the Rays' system were spent at Bakersfield (2001-2003), Charleston SC (2004) and Visalia (2005-2006). He has served four years as a major league pitching coach for the Giants (1987, 1989, and 1991) and the Cubs (1999) and guided his 1989 Giants staff to the World Series that year. He spent five years in the Cubs organization as a minor league pitching instructor before his 1999 promotion to the big league staff. His coaching career also included stops in the Florida Marlins' farm system (1992-1994), Samsung Korea (1990) while the beginning of coaching duties began in 1983 for the Giants' affiliate at Clinton (IA). DeMerritt, who resides in Venezuela in the offseason, was originally selected as a player by the St. Louis Cardinals in the June, 1971 baseball amateur draft and pitched eight seasons in the minor leagues with the Cardinals, Brewers, and Astros. "Marty's prior Princeton staffs have turned out great statistics, not only last year but any other previous year he has been here. If the numbers could be combined for the past four years, a strong case could be made that Princeton has had the best overall pitching in the Appalachian League over the past four seasons," said Holland. This coming season will mark Rincones' second as a coach in the United States, both of which will be based in Princeton. The tutoring of a young bunch of hitters in 2010 began paying dividends at the plate for the P-Rays late in the season. However, Rincones was not there to enjoy it as he was injured by a batted ball to his eye in late July and was forced to leave the team for the balance of the season. In 2009, he was the manager for the Rays' entry in the Venzuelan Summer League and guided them to the VSL title. The period of 1996-2008 also saw him work in various capacities of baseball instruction throughout his native Venezuela. He played five years (1991-1995) professionally as an outfielder in the Chicago White Sox system, reaching as high as class-A South Bend of the Midwest League in 1995. "Wuarnner played in this league in the mid-90's with the Bristol White Sox, so he too was a great addition here last year. He is a tremendous person who radiates a quiet confidence that works well with our young hitters," said Holland. 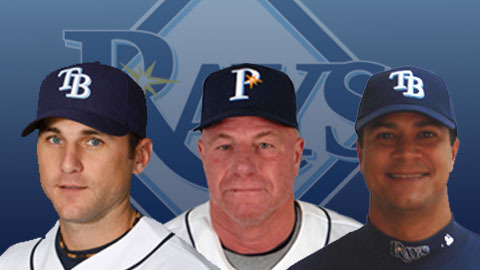 A trainer and clubhouse manager for the 2011 P-Rays have yet to be named and will be announced at a future date. The Princeton Rays are accepting orders for both season-long box seats and general admission ticket books for the 2011 Appalachian League season. Persons needing more information are encouraged to contact the team's front office either by e-mail at princetonrays@frontier.com or by telephone at (304) 487-2000.